Good Food, Good Fellowship, Good Music! The "You Tell Two" Coffeehouse -- Delta, Pa. Located one mile north of Md/Pa line on Rt. 74 - Delta Nazarene (Lower level) ----------- Where else should a Christian be on Saturday night??? Welcome to the "You Tell Two" website. This site is dedicated to keeping all informed as to when the coffeehouse is open and what special events that may occur. The public is invited anytime the coffehouse is open. Please scroll down page to find out dates and times. "YOU TELL TWO" - DATES & TIMES! * Always check events below for possible changes. Jimmy Comer passed away on April 18, 2017 - Jimmy was a big part of YTT for years. We will greatly miss him and we pray for comfort and peace for Marty and family. What a joy and a thrill it is to see our regulars and visitors that love to sing and praise our blessed Saviour. He is worthy of all honor, praise and glory! Do you have a Gospel CD or site you would like to link to our site? Send Marty or Jeff an email! We will list them below! Click here for "Pearls Poems"
It is about her family and family life over the years, growing up in Harford County, Md and York County, Pa. Please sign our guestbook at bottom of page! - SPECIAL EVENTS & UPDATES!
" SPECIAL EVENTS WILL BE LISTED HERE"
If no special event, karaoke gospel will occur. Karaoke gospel means we have nothing planned. We just love to sing and praise the Lord. The public is invited to bring your instrument and/or yourself and join in singing or playing. 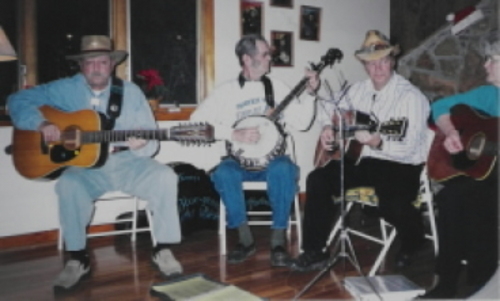 The regulars at "You Tell Two" are mostly country gospel and bluegrass gospel and contemporary gospel. We are not professional musicians! The Bible says to make a joyful noise unto the Lord. There is no cover charge and no collection plate. However, there is a donation jar at kitchen counter. Proceeds will go to "You Tell Two" use of building and food. WHERE DID THE NAME "YOU TELL TWO" COME FROM?? "You Tell Two" is a song written by one of northern Md/southern Pa's most prolific songwriters. Jeff Comer, who is Martys' son, has written several songs. You may hear Jeff perform his songs or an old standard on any given Sat night. The song is performed usually by Jeff and whoever happens to be on the stage at the end of each coffeehouse night. "You Tell Two" is a missionary statement which is what Jeff had in mind. If you tell two and they tell two and so on...... it won't take long to get the gospel through. The gospel of Jesus Christ and His saving grace is what we're about at the "You Tell Two" coffeehouse. I would like to give a praise to God for someone who has been a part of YTT coffeehouse for a long time! JIM STURGIS has given us many YTT nights of entertainment, fellowship and friendship for several years. Jims' banjo playing and great lead and high harmony singing is unmatched. 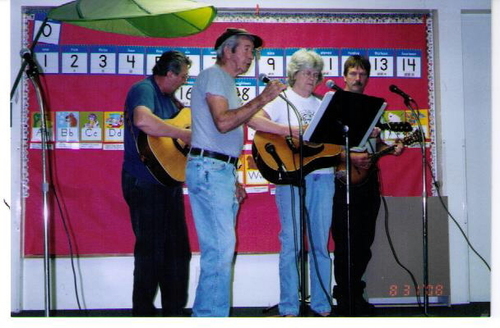 Jimmy's playing and singing and his wife (My sister) Pearl Leona's songwriting and poem writing have been enjoyed tremendously over the years. We would like to give our thanks and biggest heartfelt "YOU TELL TWO" salute to JIM STURGIS. Thank you Jim May God bless you and keep you! "You Tell Two" Guest Book! Fill in name and comments below, then view guestbook! ..After viewing guestbook, click back arrow or close tab at top to return! Submit info.....then code will appear!